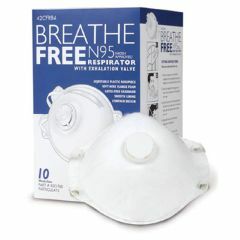 Breathe Free N95 Respirator Mask for Avian Bird and Swine Flu Protection - N95 Mask with Exhalation Valve is N95 NOISH Approved. N95 Respirator Mask With Valve Breathe-Free are high efficiency, heavy duty yet light weight to wear. This mask is great affordable disposable protection. The reinforced outer shell resists structural collapsing that can be brought on by increased humidity. The wearer will breathe easier with the exhalation valve, also providing prolonged life of the product. The wearer also gets great fit and comfort from the adjustable nose clip with foam liner and non-irritating inner face piece. Meets or exeeds the CDC and the world health organization (WHO) recommendations for flu prevention.